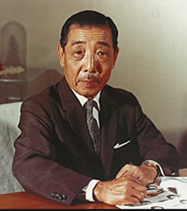 In describing Bukkyo Dendo Kyokai, it is essential to speak of the businessman and gentleman, Yehan Numata (1897-1994), the founder of Mitutoyo Corporation. He established a company to manufacture precise measuring instruments in 1934. His solid conviction was that the success of an enterprise depends on the harmonious association of Heaven, Earth and Human, and that the perfection of the human mind is attainable only through a well-balanced coordination of wisdom, benevolence and valor. He did everything he could, under this conviction, towards the technical improvement of measuring instrument manufacturing and the development of the human mind. It was his belief that the attainment of world peace is possible only by the perfection of the human mind which can be educated and benefited from the teachings of the Buddha. Therefore, along with managing his business enterprise, he exerted his efforts toward the spreading and modernization of Buddhist music, pictures and teachings. In December 1965, he had a foundation incorporated with his private funds to engage in the propagation of Buddhism, and at the same time, to be an aid towards world peace. Thus, he initiated Bukkyo Dendo Kyokai as a pubic organization.